Over the past few years, the pharmaceutical and medical device industry has seen a significant reduction in new product development and approvals due to the global financial crisis. To remedy this situation, the use of business process outsourcing services has proven to be an effective way of minimizing operational, management, and infrastructure costs. The global medical device contract manufacturing market was valued at US$ 47.5 Bn in 2017. It is anticipated to expand at a CAGR of 10.9% from 2018 to 2026. The in-vitro diagnostic medical devices segment dominates the global market. Rise in the prevalence of chronic diseases, technological advancements, increase in patient awareness and health care expenditure, and rise in the need for the diagnosis of complex diseases are major factors driving the market. The highly fragmented nature of the medical device contract manufacturing market has prompted market players to shift their focus toward relatively niche segments such as minimally access surgical instruments. The global medical device contract manufacturing market has been segmented based on device type, type of manufacturing, service, application, and region. In terms of device type, the global market has been classified into in-vitro diagnostic medical devices, diagnostic imaging & medical equipment, drug delivery devices, patient monitoring devices, minimally access surgical instruments, therapeutic patient assistive devices, and others. Higher demand for home monitoring devices, surgical & non-surgical instruments, implants, and diagnosis & treatment devices is expected to drive the medical devices market, which, in turn, is likely to propel the medical device contract manufacturing market. Based on type of manufacturing, the global medical device contract manufacturing market has been categorized into raw materials, electronics, and finished goods. The electronic type of manufacturing is gaining popularity, and the electronics segment is projected to expand at a significantly higher CAGR during the forecast period. In term of service, the global medical device contract manufacturing market has been split into prototype development, finished device manufacturing, assembly & packaging, testing & regulatory support services, molding & casting, and others. The prototype development segment is likely to hold a major share of the global market as successful prototyping identifies and helps correct problems long before they can negatively impact and irreparably harm the finished project. Based on application, the global medical device contract manufacturing market has been divided into cardiovascular, orthopedic, neurovascular, pulmonary, oncology, laparoscopy, urology & gynecology, radiology, and others. Expansion of the orthopedic segment can be attributed to the growing geriatric population affected with arthritis. 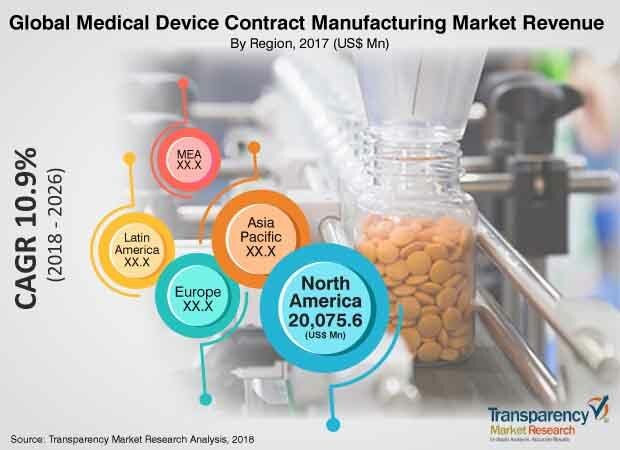 In terms of region, North America dominated the global medical device contract manufacturing market in 2017, owing to a highly developed health care sector, increase in awareness among health care providers about medical devices, and continuous evolution of advanced medical device products. North America is also an attractive region of the market, in terms of revenue. Rise in the number of government initiatives and laws and increase in population drive the medical device contract manufacturing market in the region. Technological advancements and increase in manufacturing sites are expected to propel the medical device contract manufacturing market in Asia Pacific, Latin America, and Middle East & Africa during the forecast period. Key players operating in the global medical device contract manufacturing market include Flextronics International, LTD., Jabil Inc., Benchmark Electronics, Inc., Integer Holdings Corporation (Greatbatch), West Pharmaceutical Services, Inc., Tecomet, Inc., Nortech Systems, TE Connectivity (Creganna Medical), Forefront Medical Technologies, and Nordson Corporation.